The Falcon Eyes CRK-42 SLG 5 in 1 Reflector is a standard diffuse reflector supplied with a removable cover. This removable, zip up cover is reversible and equipped with 4 different colours: white, gold, silver and sunny gold. 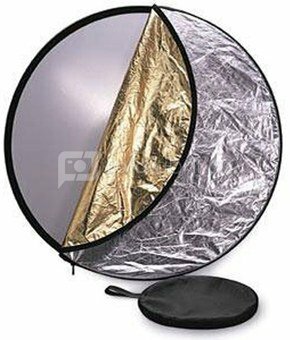 The reflector has a diameter of 107cm and can be folded and packed away in the supplied carry bag. The Falcon Eyes reflectors are durable and of high quality, making it a good investment for your photo studio. This reflector is also available in the following sizes: 30, 56 and 82cm.